Deciding that Vagabond needed a tandem sit-on-top was a no-brainer. Deciding how to actually design it was a different story. There are so many possible applications, and any design is bound to be a compromise between the many different possibilities. 1. I wanted both paddlers to be able to paddle efficiently without the paddle of the back paddler hitting the front paddler. 2. I wanted speed. I’m tired of paddling tandem sit-on-tops that just push against the water ahead of it instead of slicing through. 3. I wanted glide. Because sometimes I need to take a rest too, and nothing is more demotivating than to stop paddling for a few seconds and to come to a complete halt. 4. I wanted loads of carrying capacity. Because I have some friends who are much bigger than me, and they need to be able to paddle the boat too. 5. I wanted lots of stability. The reason many people have a tandem kayak is to take friends and family who have little paddling experience with them. Those friends and family need stability! 6. I wanted the boat to handle fast currents and little rapids. Just because. 7. Lisa, with her adventure racing background, requested a solution for quick-and-easy storage of backpacks and dry bags. In addition to these parameters, the boat obviously needed to have Vagabond’s trademark ease-of-paddling with cutaways on the deck for natural paddling strokes, comfortable seats where the feet lie lower than the bum, and all the fittings that make Vagabond’s kayaks such a pleasure to use. To accomplish the first goal on my list, I spaced the two seats quite far apart. Having the two seats too close to each other is a common problem in recreational tandem kayaks, and there are two reasons for this. First, it is not easy to design a hull that is trimmed correctly when the paddler at the back sits close to the stern. Secondly, there is not much room in the front to move the front paddler further forward. It took some trial and error and a lot of calculations, but I managed to create an asymmetrical hull that is perfectly balanced with the seats so far apart. The hull trims beautifully even if the back paddler is much heavier than the front paddler. To accomplish goals 2 and 3, I used the same design concepts that I developed for the Kasai and Marimba hulls, although I had to apply these concepts a bit differently to accommodate the asymmetrical nature of the Mazowe hull. To accomplish goals 4 and 5, I had to add width. 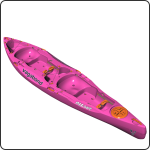 A wide boat is generally not fun to paddle at all, but the big cutaways I added for the back paddler, where the boat is at its widest, makes a huge difference. You simply don’t notice the width of the boat with these big scoops on the deck. Goal 6 required tweaking of the sidewalls and other details. Naturally, I drew on my whitewater design skills to accomplish this. Moving the back seat so far back created space in the middle of the boat for a compartment that is perfect for the storage of dry bags and smaller backpacks, like those commonly used in adventure races. This compartment in addition to the stern tankwell accomplished goal 7. To finish off the design, I added all the fittings common to Vagabond’s sit-on-tops, including a paddle rest and bottle holder for each paddler. I’m really happy with how the design process of the Mazowe flowed to create the boat that we are now putting into production. I think that I have found the best possible compromise to create a tandem that has all the functionality we wanted while making it look good too.